Add another layer of security to your JuanTax account. Note: Before you proceed, make sure to download and install an authenticator app that suits your device. If you use an iPhone, iPad, iPod Touch, Android or Blackberry device, you may install Google Authenticator. For Windows devices, you may have to use Authenticator+. Once you log in to JuanTax, click on your name (upper right section), then click on Account Settings. In the User Settings tab, you'll find Two-Step Authentication. Move the toggle to the right to activate. Open your Authenticator app, since you'll be needing that in this next step. Notice that we created a QR code for you. You have the option of scanning the code using your Authenticator app or manually setting up your Authenticator using the key we produced. Either way, after successfully setting up your Authenticator, it will produce a unique 6-digit code which typically refreshes every 60 seconds. 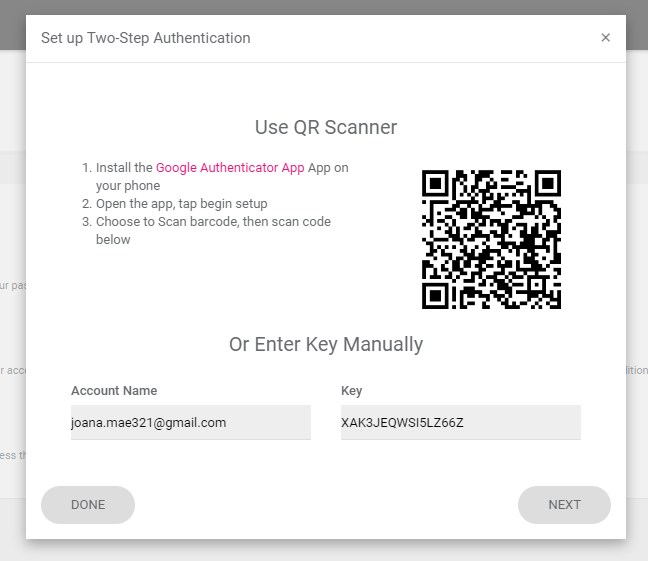 To finish the enabling two-step authentication, click Next, enter the 6-digit code that appears on your Authenticator, then you are good to go!